After writing a long, long rant, back to my normally scheduled random posting. Today, I decided to approach a probable terrible idea. Yesterday, after some time in a thread with a self entitled 'everything is wrong in eve and tis a terrible game' person, I decided to write up an opinion/review of the new player experience. The above player used other games to base their opinion on why eve's tutorial was terrible. I decided to use my own recent experience in another successful MMO to compare the two. I've been playing Aion (not successfully, I just made it to level eight after 2 weeks). I also used it for comparison because it is a themepark MMO and that is where a lot of eve's player base is going to have gotten their feet wet in playing. As I typed up this review I wrote something that struck me. I was writing about how I was mindlessly running around and I wrote that, "I could see that the NPC titled 'general goods trader' was a merchant." I then compared it to eve's market button. As I did that I had a little moment of realization over a big difference between eve and other games hit me. Eve has an avatar area that most of the game works hard to forget about. Most games focus heavily on the avatar. This should not be a realization to me, but I play Eve. Spaceships are how I am used to seeing myself. 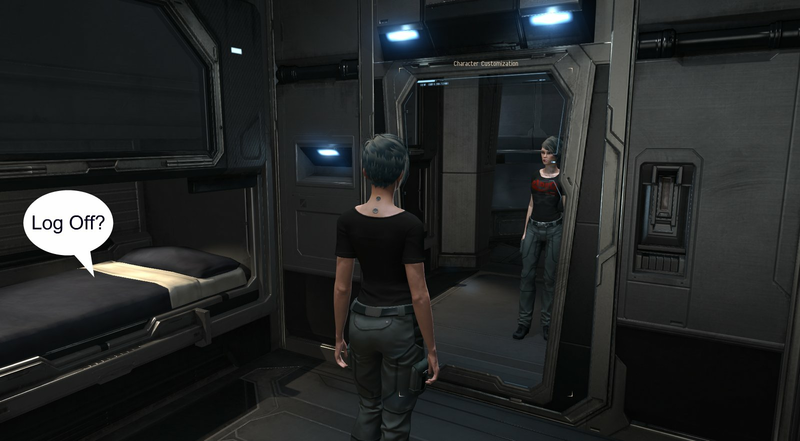 Eve now starts new players out in their captain quarters. Players are given a familiar aspect of having an avatar and walking around. there are some interactive options. WIS (walking in stations) is a pariah to be mentioned to the eve community at this time due to the still powerful echoes of the Incarnia disaster. However, the captains quarters are here. I remember exploring mine and clicking everything. I expected more stuff to happen. I figured I wasn't getting it. Click click click. Walk walk walk. Nothing. Hmm. Okay, whatever. Spaceship down the hallway! The Idea What if more happened in the Captain's Quarters. I am not asking them to code new objects but I am asking them to make items more interactive like the television and ship hologram is. If I click the bed it should ask if me I want to log out of the game. If I click one of the panels, maybe with a market icon swirling over it like the ship holograph, I should get the market. If I click something else it should open up my wallet. If I walk down to the hanger, on the control panel there should be another hologram that shows me my inventory since it is now its own magical NEOCOM button. 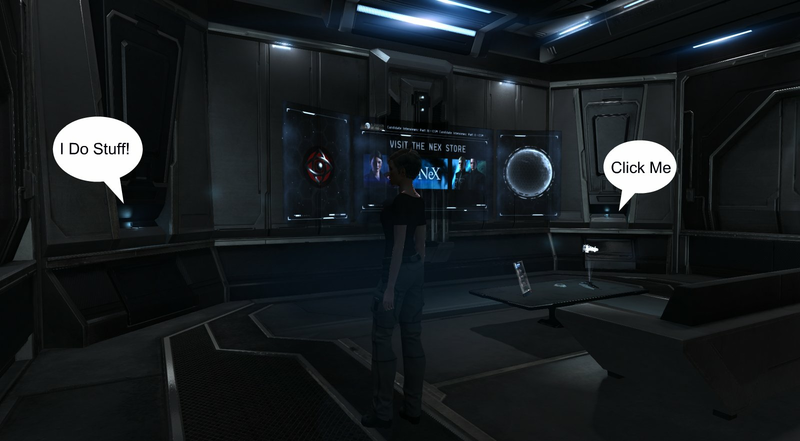 All of the NEOCOM buttons, or at least most of them, should have an interactive spot in the captains quarters. Again I don't say that they have to make new items or add anything to the captains quarters. just make things clickable. New players explore their environment. They explore the safe spot they start in by looking around, walking around, and clicking things. Most players eventually get obstructions on how to leave the captains quarters behind. That is fine. I'm not talking about eve in general we're talking about accessibility to the various menus that we need to do things in a format that new players will easily grasp. There is a lot of time being spent focusing on how to make the tutorial better. How to say things. Where to have our buttons point. But, a lot of eve is very hard to teach through an automated tutorial menu. I've been struggling with the fleet window lately. It's not intuitive at all. It's terrible. So is the POS menu. But, because I know that right clicking is always the option and I understand the basic mechanics of the game, I'm able to struggle through them and turn to Google while muttering curses under my breath. But that is not what we want for a new player. 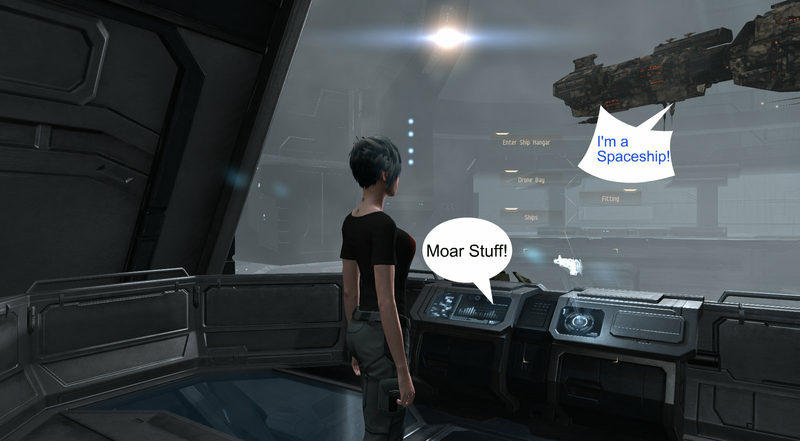 by giving them interactive things in the captains quarters, a new player will self teach themselves that items exist. By clicking on something that makes the market come up, they will now know there is a market. if the tutorial wants to pop in and direct them to the NEOCOM then, great. However, people will self learn some of the very basics in an automatic natural progression that they understand due to prior experiences in other games.